FLIGHT OF THE LIVING DEAD................I'm just going to use my imagination really really hard and pretend that the creators didn't in some way try to cash in on the not-so-successful SNAKES ON A PLANE hype that lasted about ten seconds. The reason why I say that is because I ended up really liking FOTLD. For a low budget crappy movie this is one isn't that bad. It has a good sense of humor and there is a high level of excitement to the film. It doesn't get bogged down in melodrama of overly long character development blah-blah-blah. Its about zombies on a plane and what you do when you have zombies on a plane. You shoot them in the face.....and the nuts apparently. There are some recognizable faces and some generally good performances sprinkled throughout the film to keep the bad performances at bay. Remember the bad guy from KINDERGARTEN COP? Guess what. He is one of the heroes in FOTLD. (Along with some guy who looks like Nathan Fillion's older brother.) That is pretty cool, eh? And yes, I do consider his performance good. While most of the film is limited to interiors of a plane the movie still manages to not look boring or stale thanks to a great use of color and some creative camera angles. Yeah, they do use some of the same creative camera angles a little too much but that is a small complaint and only noticed by people who have too much time on their hands to notice such trivial things. All I am saying is that you get to see a lot of people get pulled down the same hole in the floor over and over again. As far as zombie carnage goes there is a lot of it. Zombies are everywhere. They crawl through vents, smash through mirrors, claw through the floor. One takes down a fighter jet! People are bitten and quite often find themselves torn to pieces in their seats. This not a plane you want to be on, folks. Thankfully there are a couple of cool dudes whose jobs require them to carry guns wherever they go to shoot the zombies for our entertainment. They do kill a lot of zombies which is the biggest reason why I like this film. I don't really have a lot to say about FLIGHT OF THE LIVING DEAD. (Because I am a terrible writer. Hee-Hee!) I was just surprised at how much I ended up liking the film. Its a crazy film but it doesn't go shark-jumping-out-of-the-ocean-and-eats-a-jumbo-jet-Syfy-Channel crazy or giant-snake-eats-an-entire-train crazy. I guess it comes close a couple of times with the fighter jet and all. 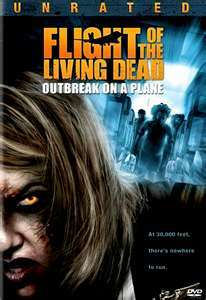 The movie is slightly creative enough not to call itself ZOMBIES ON A PLANE. If you are big into zombie films give this one a try you might just agree with me for once. I do believe that this is probably the first zombie movie where a zombie dies by being shot in the balls. Think about it. Doesn't it make more sense to shoot a male zombie in the junk than in the head. I mean we are suppose to shoot them where their brains are, right?